Ironbark’s Business reporting software is timely and accurate; providing for precise reporting for day-to-day decision making. Integrated analytics and intuitive dashboards ensure that reporting with Vision is smart and uncomplicated. Reports link to your data, so they stay up to date with minimal maintenance. Drilling down on reports for data sources is provided for. Ironbark Business Reporting software allows for flexible Microsoft Word and Excel reporting. 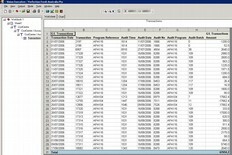 Vision XL functions provide a dynamic link between Excel and your databases with full security support features to ensure access to sensitive data is performed by authorised users only. Cube analysis provides for multi-dimensional comprehensive reporting. The Vision Business Intelligence tool, supplies the architecture you need to calculate information and generate reports for distribution throughout your enterprise. Download the Ironbark Business Reporting Software overview now, or call us today on 1800 649 524!